What’s up XRCEL world, my name is Justin Hughes. Born and raised in Maryland, however now currently living/working in New Jersey for the last 5 years. I currently work in Information Technology supporting Supply Chain for one of the world’s leading healthcare companies. I’ve been racing triathlons for 4 years now. Before triathlon, I played golf at the collegiate level for a small Division 3 University back home in Maryland. Super excited to be part of the XRCEL family and use XRCEL as my main training and racing fuel (fun fact: peach tea is my favorite). First got into the triathlon world back in 2015 when I joined a relay team with two other colleagues from work as the team’s swimmer. Mind you I didn’t come from a competitive swimming background. They asked if I knew how to swim, I said yes, and they responded with “cool, you’re in”). Needless to say those 750m were way harder than I ever imagined, but I survived. The following year I had the lofty goal of finishing the Sprint distance race as an individual. As a complete rookie, went at it without any sort of training plan, coach or expectation, just wanted to finish. As you can probably imagine, it definitely wasn’t the prettiest of finishes, but crossing the finish line was unlike any feeling I had ever experienced, and I was instantly hooked. 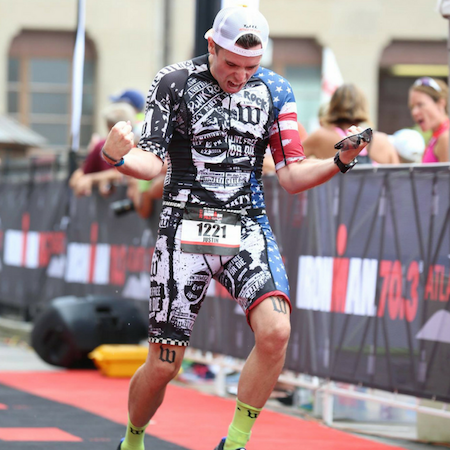 In 2016, I went out on a whim and signed up for my first half at Ironman 70.3 Eagleman. By no means did I set any land speed records that race, but I sure did learn a lot about myself and knew that I had found my new sport / challenge. Since then, my main focus for 2017 and 2018 has been the 70.3 distance. In my eyes, triathlons, especially long-course, is the ultimate test of the body and minds’ ability. In 2015, I wasn’t necessarily living the healthiest of post-college lifestyles you could say and was looking for something that could get me back on the right track. Happened to stumble upon triathlons and it has completely turned things around for the better. As far as goals in the sport, I have my sights set on tackling my first full in 2019 (targeting Ironman Maryland). Aside from a 140.6, it’s a total pipe dream, but I’d like to one day qualify for 70.3 Worlds. I love fueling with XRCEL because you never have to worry about the dreaded BONK ever again. Since making the switch to XRCEL, I’ve really seen a difference in my training and racing. Whether it’s an easy day on the trainer or a massive “hero session”, a sprint or a 70.3, XRCEL gives me not only just the immediate kick, but also the extended release for sustained output.